It's ugly. It has terrible navigation. All of the documents are in proprietary formats like Word and Adobe Acrobat. Of course, it's the website of the Federal Communications Commission, the agency whose chairman has helped media conglomeration move forward at every turn and discouraged public comment and sometimes even dissemination of their own reports. This year, the prize goes to a government-sponsored website intended for uploading rather than for downloading information. Would-be travelers who found themselves on the Transportation Safety Administration's dreaded "no-fly list" or "watch list" could try to state their cases on the page for the DHS Traveler Redress Inquiry Program, where they could fill in online forms with evidence that might confirm their law-abiding identities. Unfortunately, this website for uploading sensitive personal information was itself insecure and looked more like a phishing site run by scammers to a careful Internet reader. At least this, most hated federal agency in recent polling has introduced seasonal themed logos on all its websites. The official PowerPoint assessment of violence in Iraq by General David Petraeus would probably earn the prize in the minds of many this year for its disingenuous data representation, according to Seth Grimes, Kevin Drum, Matthew Yglesias, and others interested in information aesthetics. But I'd give the gold star for PowerPoint abuse this year to the E-nonsense of the 2008 E-gov budgetary report on information technology, which indicates the fundamentally incoherent character of IT policy at the highest federal levels. I'd have to give my vote to Future Force Company Commander, which Sean Lawson points out is strangely unconcerned with either training or recruitment, the ostensible motivations for creating other military games. Lawson argues that it appears to largely justify the services and high-tech gadgets of large-scale government contractor SAIC. The National Center for Missing and Exploited Children and the Ad Council have teamed up to produce several multimedia offerings about cybersafety that are sure to either be ignored or to reinforce the voyeuristic paradigms that they are supposed to be combatting. The ID the Creep game doesn't actually teach anything about critical thinking in online behavior, and the Think Before You Post viral videos are full of sleazy imagery and prurient narratives that sexualize pre-teen girls in the same ways that advertising culture, horror movies, and other spectacles of sexism and ageism already do. The security video that the Transportation Safety Administration posted to defend their side of the story when a disgruntled passenger complained about unreasonable treatment as a result of her child having a sippy cup in security screening actually did the agency more harm than good, since the video of the harried mother down on her knees only reinforced the perception that the agency was humiliating travelers without reason. 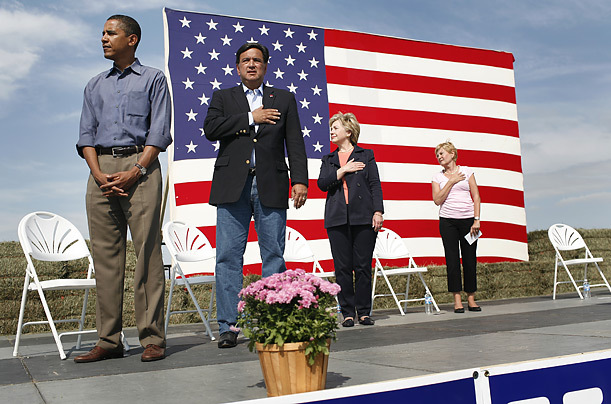 The urban legend that Barack Obama refuses to say the Pledge of Allegiance may have been one of the worst online smear campaigns of the 2008 election season thus far.